There have been 2,085 images uploaded to this topic. (View topic image gallery). There are 6543 posts in this topic. You are on page 131 of 131. I'm planning on getting my first coat of clear on a JOKERZ this weekend... 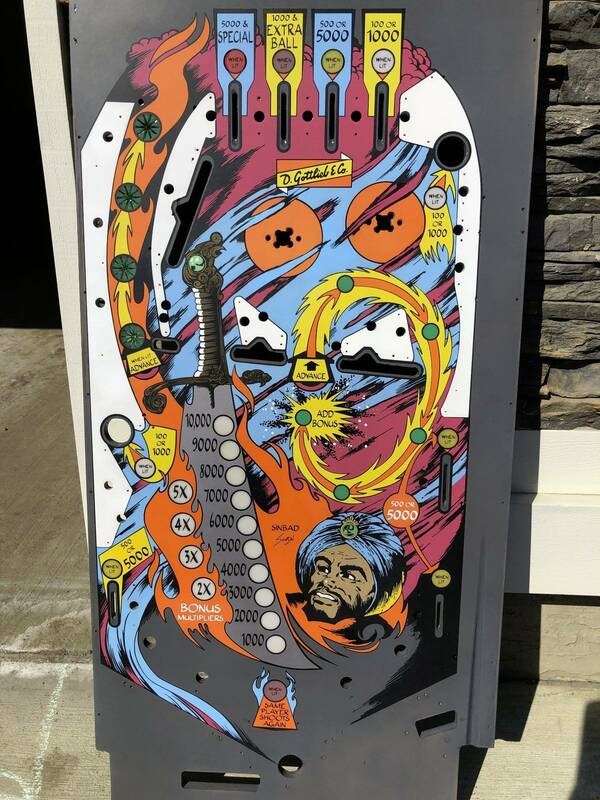 The playfield is a bit bowed though, is that something I should try to remedy prior to clear coating? It's noticeable but goes away when the side rails are back on -- Should I try to clamp it down across the length before clearing or just clear as-is and reassemble as usual? I know clear has a little flex so I'm sure it's ok, but would appreciate confirmation. Thanks! I built a box to hold my playfield while I clear. 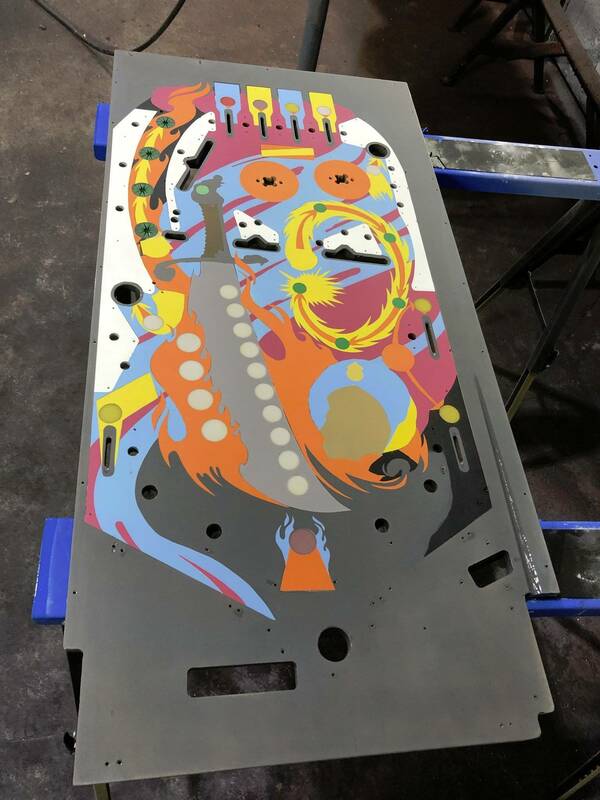 I supports the sides all the way down thus flattening the playfield. Thanks vid for this guide, learning to use frisket and an airbrush was really game changing . One suggestion that I have, get a scalpel and blades from amazon. Its a lot cheaper than an exacto and you will be more likely to switch blades more often because of it. I think I got about 100 blades for less than $7.00. But watch a video of how to put the blades on - its easy but not obvious, and you will cut yourself doing it wrong. Definitely get it flat for your work. Do it in a way such that it doesn't flex again during or after your work. Too much flex during or after your painting can cause ghosting of the clear. 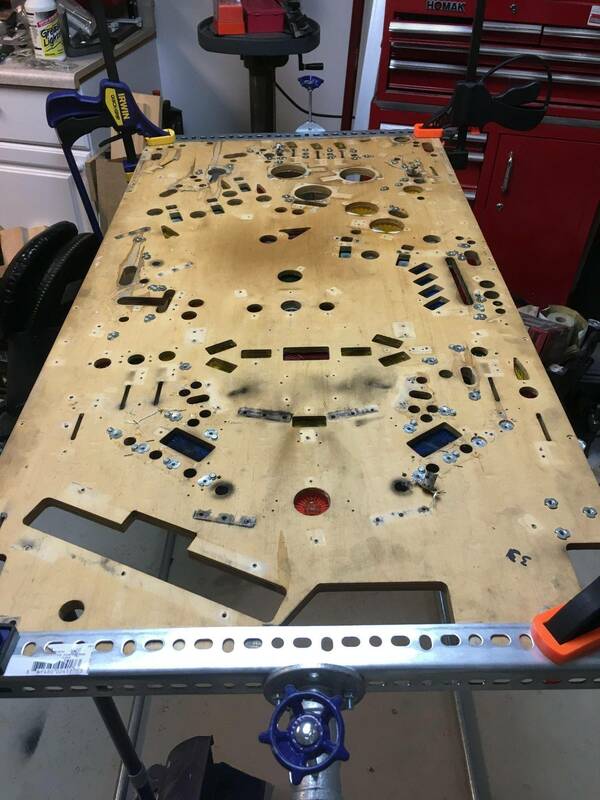 I think I remember Vid suggesting screwing the rails to the underside of the playfield to give it support. 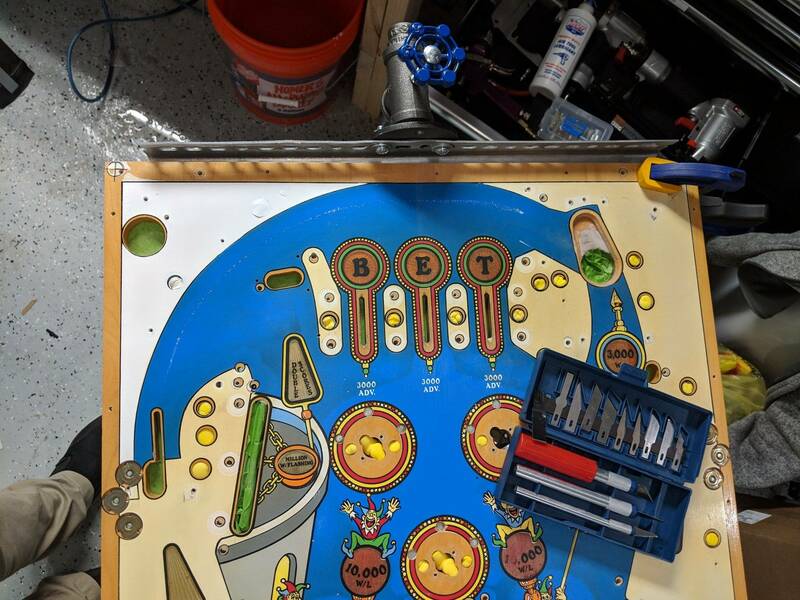 I suggest when you are done, replace them up top one at a time so that the playfield is still supported on at least three sides during the process. Paint restoration takes so much time that I've decided that you can't be too careful. These simple precautions are a drop in the bucket timewise. Lonzo's idea is best. With his suggestion, the playfield is totally supported at all times. I actually got this exacto set a long, long time ago for a few bucks from a Sears Outlet, so it's just nice to finally use it. When I run out I'll look into that though. Though, honestly, even exacto blades almost seem too sharp -- just the weight of the tool alone is capable of getting into the playfield! Hmmm. I was being lazy but thank you for the reality check. I wish I had a jointer so I could just build a nice box that I knew was 100% level -- I might be able to bring some 1x6s over to my local school and use their jointer. How are you guys doing boxes, are you just buying pre-finished wood? 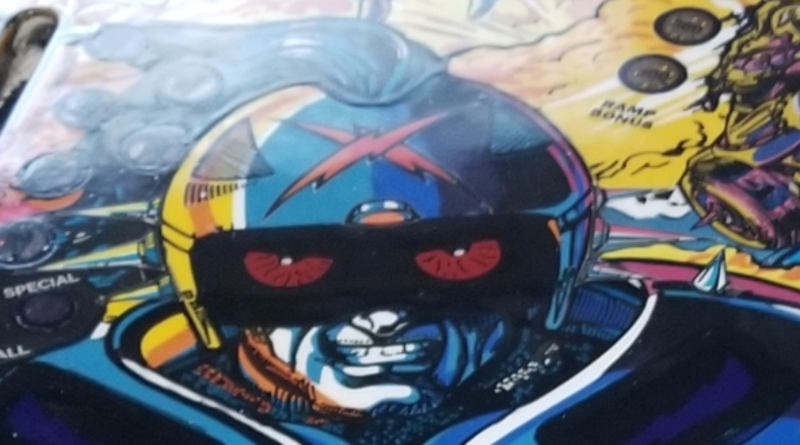 How do you all feel about bothering to preserve key lines around light sockets that are hidden once the playfield is assembled anyway? I noticed on my JOKERZ! that the majority, if not all, are not visible once assembled and they are all misaligned from the factory anyway lol. Just ignoring them could save me a good bit of time cutting frisket, but is that lame? 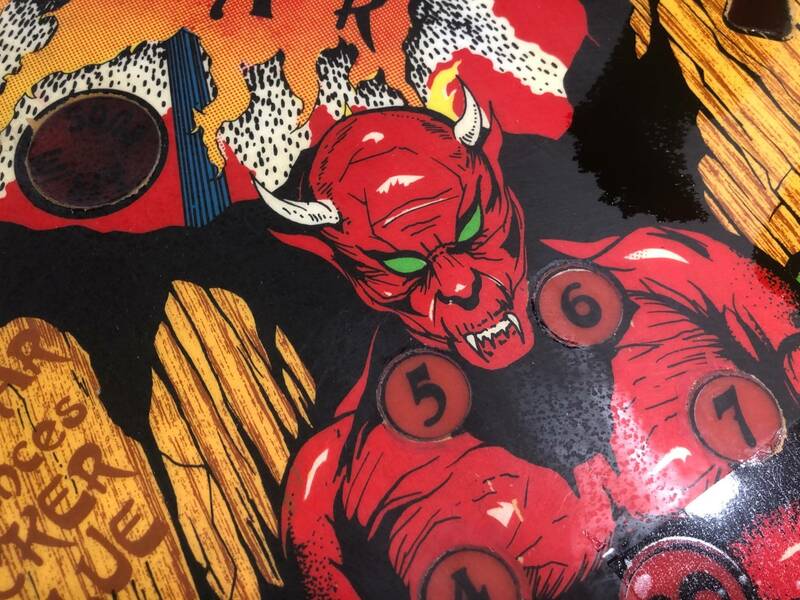 The original playfield would just flake if you ran your finger across it and the inserts were so bad. The upper inserts at times could actually hold the ball in them and a few were melted and distorted due to the bulbs being pushed right up and touching them. This go around was a breeze with masking and painting as after first bar sanding, fixing the planking areas using my wacky CA glue idea I cleared everything with 2k prior to paint. Nothing on this project lifted or peeled during masking even when I was aggressive with it. After base colours were done I locked it in with more clear then moved onto black then more clear, then final then clear, then noticed I forgot his eyes so more airbrush work and then FINAL clear. Got some contaminants in the 3000grit sand and it scored the clear in a few spots. I hope it will not be noticeable after is all back together as I have a gun to my head to finish it. I also would like to add more black accents to the blue and magenta coloured areas so that will be a good time to do so and then re clear again in the future. 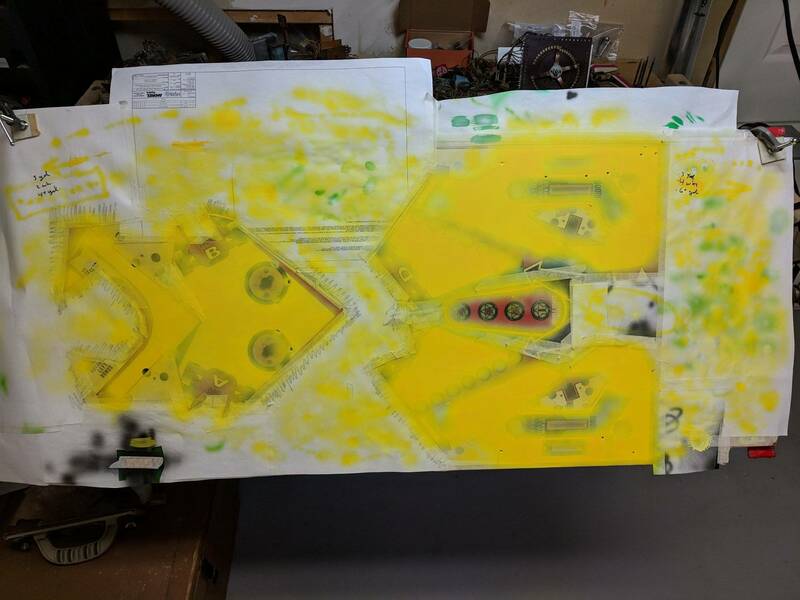 My repaint of the Lectronamo in August of last year taught me a lot about prep work I never did correctly. This time around with the CA fix and the clear prior to painting things went perfect. This time around I tried something a little different with filling any low spots with clear. Instead of just applying it to just the low spots and letting it dry then sanding, I applied clear with a dropper, waited 15 min then gave the field a spray wait the 15 min flash time then another good coat. The coats over the dropper areas actually blended themselves outward very well and sanding them down after was very minimal. Well , in my case I try to preserve any original line and/or detail hidden or not. 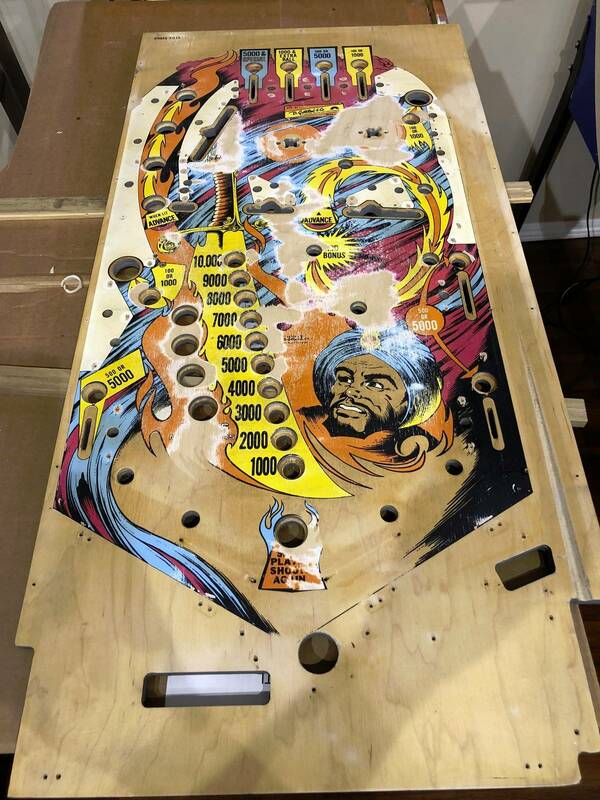 I feel that I need to respect and preserve the playfield as much as possible regardless of time and hours spend in restoring it. Of course others might feel differently . 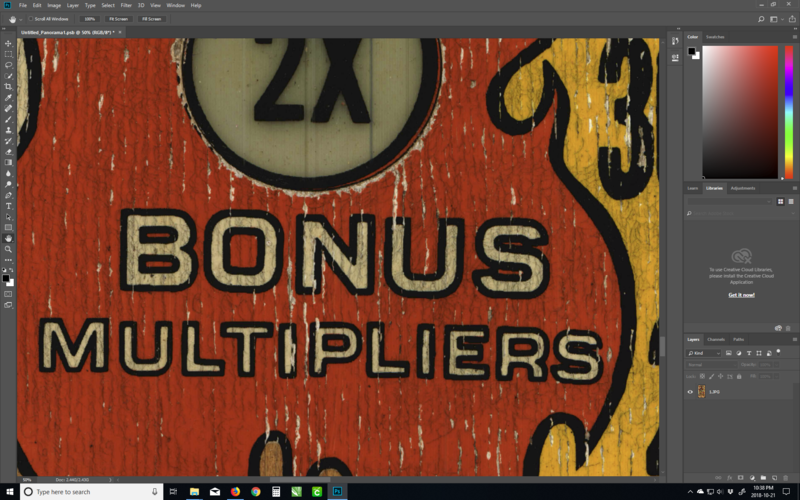 Comparing the original lettering with the final outcome , the letters and labels differ a lot . was that intentional ? Nice custom repaint - clean and one of a kind. I changed it up a bit. I changed it up a bit. I wanted more emphasis on the sword and not the bonus text. That where the text change idea started and recolouring the sword to something more realistic. The font used has an Arabic feel to it. Did you repaint all of the black detail or use waterslides? Totally personal choice. For a game that I plan to keep for myself I ask, "Will it bug me later?" For a game I plan to sell I ask myself, "Is the buyer going to care about this / is it worth the effort?" Then was it stencils for all the artwork or freehand? I call it freehandingstencilpainting (tm). Some are cut on a vinyl cutter after drawing them in vector format, some are free hand cut from stencil material and blade knife, and some is masking with blade knife. I was going to do a actuall repaint and give everything shades and shadows to give it a more real look but chickend out. 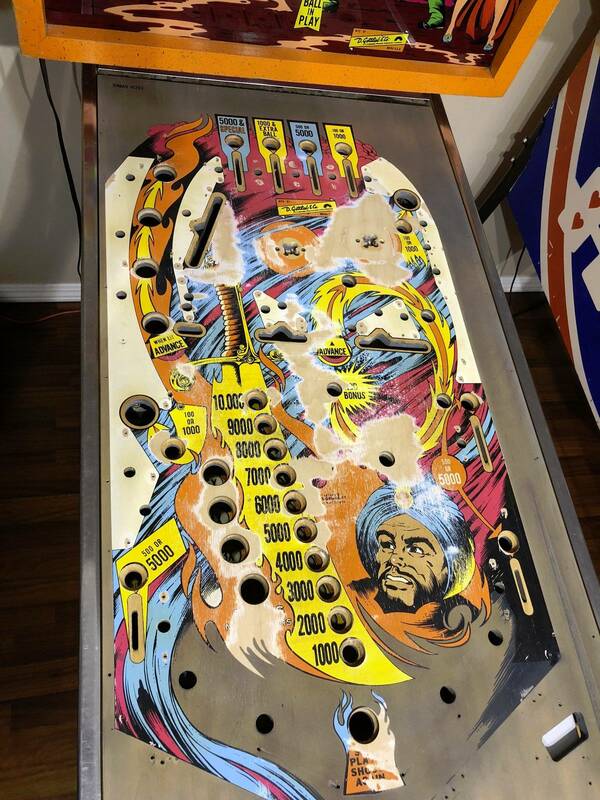 Ready to clear my Batman Forever playfield, but here is the bottom side. Any advice, besides sanding it? I feel like I need to clean the carbon dust and grime on the underside of the inserts. I almost want to sand it and then clear it... maybe even sponge/roll on a layer of clear polyurethane. Anyone ever try to use a black wood stain to hide stains? 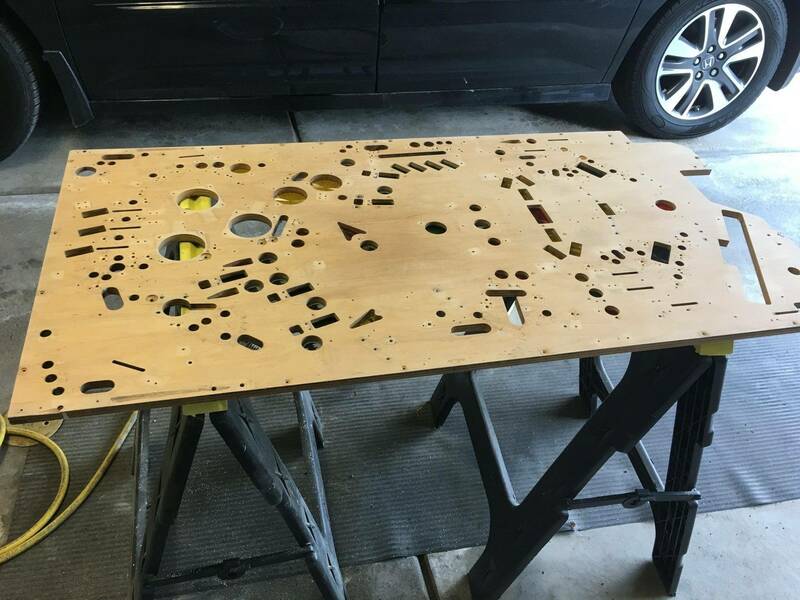 After sanding, use a grime spray and q-tips to clean out the insert backsides? Any tips? Clean out the inserts with q-tip and alcohol or naptha. Scrub off all the black you can. Sand it a bit after its dry. They used to paint the bottom side gray. Somebody might question the black stain if you ever decided to sell. I would clean the inserts and palm sand it. I like your idea of sealing it with polyurethane. Guess what cleaned up with some sanding! I think I will add some clear to help protect and keep it clean. Put pieces of cut up sponge in the holes to keep clear out of the inserts when painting. Just for the record, I tried using crumbled up paper towels, and I regretted it. Use the cut up sponge method because little bits of paper towel get clung onto the edge of the insert hole and are a mess to clean. It cleaned up, but what a pain. Auto body guys use little cone shaped pieces to fill holes along with other various cut foam pieces. They pull them out while paint is still very wet. Or clamp it to your rotisserie, turn it upside down and paint/seal the bottom (which is now facing the floor) with a foam brush. 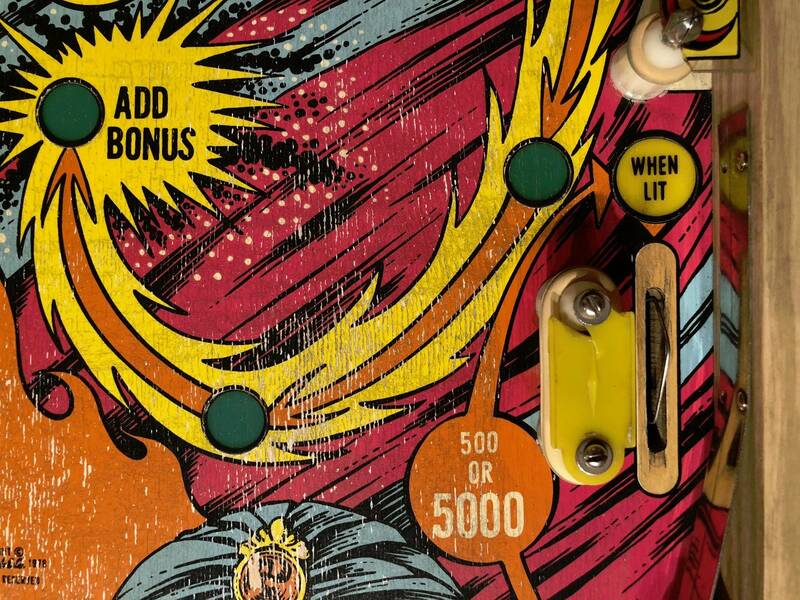 Any drops will naturally fall away from the playfield. You can do the areas covered by the clamps after you flip the rotisserie back right side up and remove the clamps. 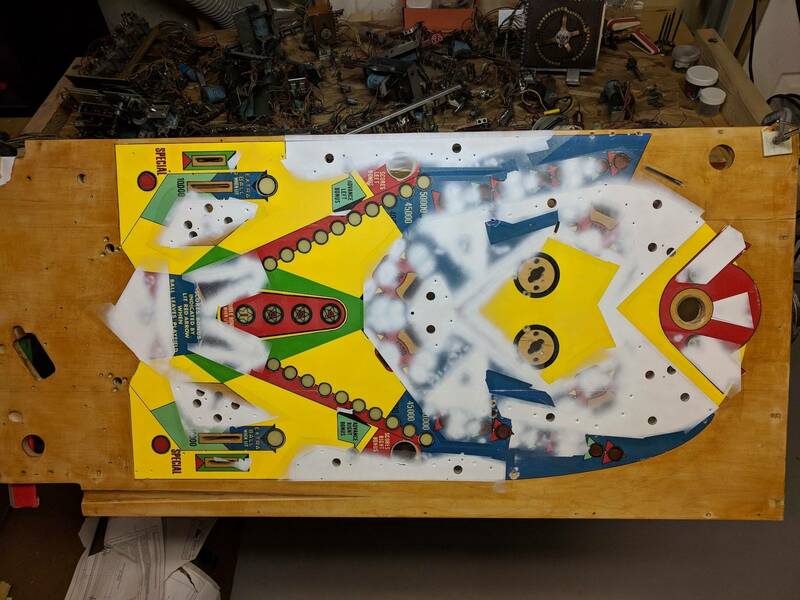 I wish I had the guts to disassemble the bottom of a playfield like that, it would make the restoration process so much more straight forward! Alas, I do not have said guts. Looks nice but you could make it even nicer by using a belt sander first. Then use a DA sander to finish up. 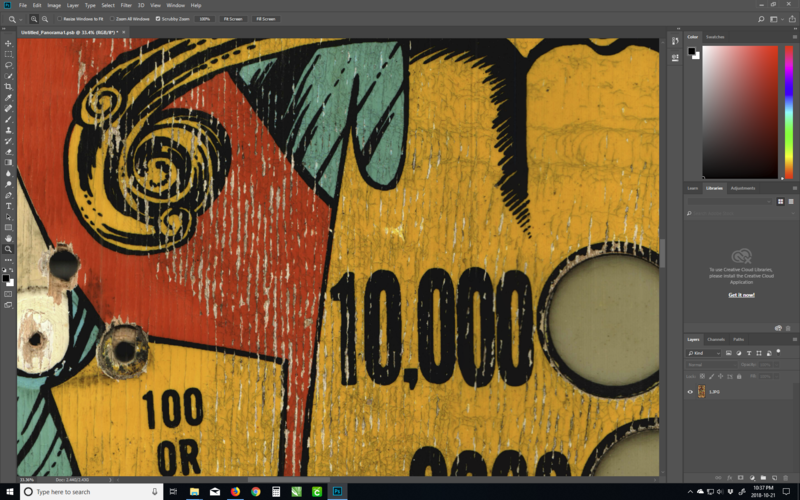 I've done this on every playfield and they look almost new. I've also never sealed the underside and all my games look just as nice as the day they were done. The pic is from the first passes with a DA 240 ( I ran out of 120!) . I bought more and went back and used 120, then 240 again. It looked even better, but you could still see some of the faded areas. I'd be nervous about my belt sander. Do I have some thickness there? Which grit for the belt? There's not a lot of veneer on that layer but whatever they used on playfields, it's extremely hard. I've never had an issue with going through it. I'd use 80 or 100 grit. Whatever I had on hand. It'll take a number of passes. I then follow up with 80 then 120 with the DA. I've used 240 before but it didn't seem to make much difference so 120 is where I'd leave it. This is all taking for granted you know how to use a belt sander. As a bit more than an amateur woodworker, I'd have to disagree. I don't think a belt sander is appropriate for a playfield (or plywood in generally, really); it is way too easy to remove too much material. A DA is really the way to go from start to finish. Looks like this Color Laser is on sale at Amazon... anyone have any experience with Canon Laser printers or this model? 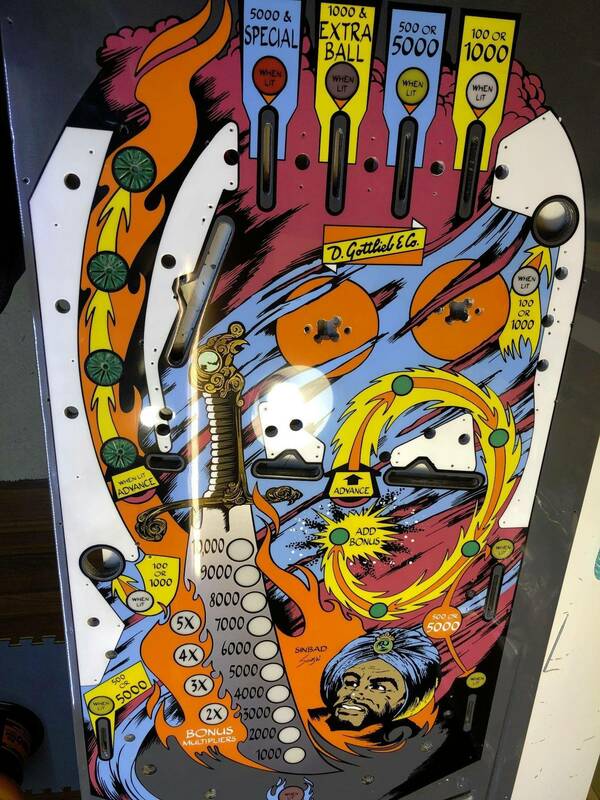 I bought a black/white one, but need to print full color decals for a playfield and this looks to be a nice entry level one that'll fit the need nicely. vid1900 or anyone who might have dipped their toes in this water. Considering removing gorgars eyes to light them up from under the playfield. 1.) what kind of “insert” could I use for this? I assume that a sticky clear decal would be too unstable to hold in moving the machine and coil shaking? I don’t really have anything to cut plexiglass cleanly and because this is such a small insert, ... ugh. Then we'll have to agree to disagree. Like I said, that outer layer of ply is extremely hard and takes forever to sand with just a DA. I've used the belt sander on somewhere near 100 playfields and have never had an issue. You'll get the job done with just a DA, but it'll take you a hell of a lot longer. Maple is very hard. Old maple is like a rock. The other way is to use a small standard insert and make it opaque except for the eyes. I'm in the middle of a restore on a Motordome, sorry don't have a pic of it illuminated. he other way is to use a small standard insert and make it opaque except for the eyes. formation and have an L.E.D. light it up. Then, all you have to do is cut the eyes out... ;very tedious work. 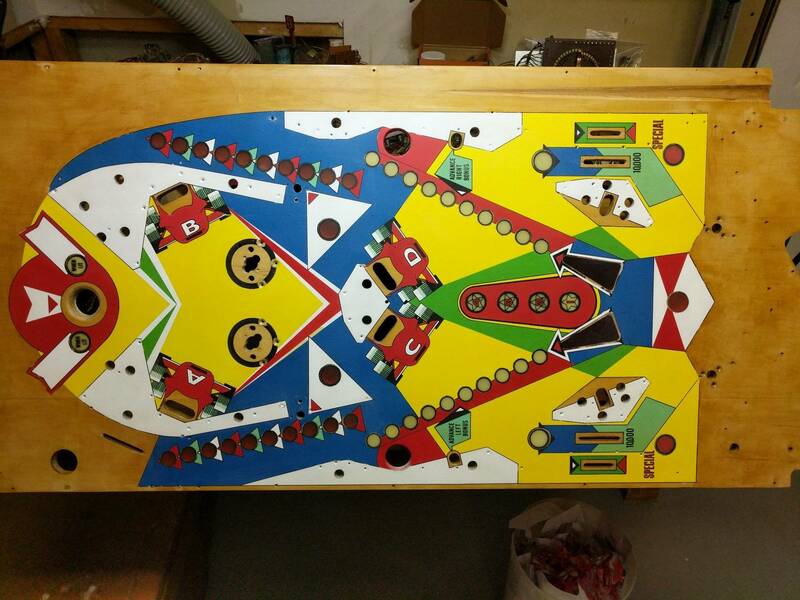 Finally, push the new inserts from the top/bottom of the playfield till flush with the top of said playfield. Might have to be a round nickle size base plate with two tall eye shaped towers. Their is available hobby plywood you can use to experiment on. Word, of course if it works it works for you. I guess what I meant to say is that anyone unfamiliar with how powerful a belt sander can be should be cautious until they get a feel for it. One could easily rip through too much with the wrong grit/movement.